Deepa, M., Karthikeyan, M. (2009). Cefpodoxime Proxetil Floating Microspheres: Formulation and In Vitro Evaluation. Iranian Journal of Pharmaceutical Sciences, 5(2), 69-72. M.K. Deepa; M. Karthikeyan. "Cefpodoxime Proxetil Floating Microspheres: Formulation and In Vitro Evaluation". 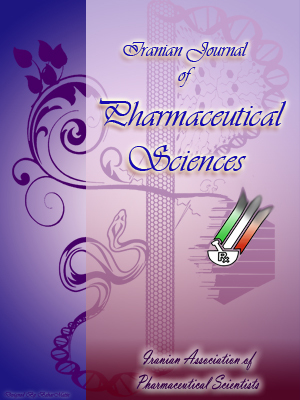 Iranian Journal of Pharmaceutical Sciences, 5, 2, 2009, 69-72. Deepa, M., Karthikeyan, M. (2009). 'Cefpodoxime Proxetil Floating Microspheres: Formulation and In Vitro Evaluation', Iranian Journal of Pharmaceutical Sciences, 5(2), pp. 69-72. Deepa, M., Karthikeyan, M. Cefpodoxime Proxetil Floating Microspheres: Formulation and In Vitro Evaluation. Iranian Journal of Pharmaceutical Sciences, 2009; 5(2): 69-72. The objective of the present study was to develop floating microspheres of cefpodoxime proxetil in order to achieve an extended retention in the upper GIT, which may result in enhanced absorption and thereby improved bioavailability. The microspheres were prepared by non-aqueous solvent evaporation method using polymers such as hydroxyl propyl methyl cellulose (HPMC K 15 M), ethyl cellulose in different ratios and cefpodoxime proxetil in each formulation. In vitro drug release were performed by USP apparatus type I and the microspheres were characterized by polymer compatibility by using FT-IR. The yield, particle size, Buoyancy percentage, drug entrapment efficiency, and in vitro drug release were studied. The result showed that microspheres yielded 50.5-72.2%. The particle size was distributed between75-600 μm, drug entrapment efficiency was 14.1-28.2%, and Buoyancy percentage was 70.1-88.3%. The best drug release profiles were seen with formulation 2 at the ratio of drug to polymer of 1:2. Gastro-retentive floating microspheres have emerged as an efficient means of enhancing the bioavailability and controlled delivery of many drugs. The increasing sophistication of delivery technology will ensure the development of increasing number of gastro-retentive drug delivery systems to optimize the delivery of molecules that exhibit low bioavail-ability and extensive first pass metabolism. A gastric floating drug delivery system can overcome at least some of these problems and is particularly useful for drugs that are primarily absorbed in the duodenum and upper jejunum segments, and it can prolong retention times of dosage forms in the GIT, and thereby improve their oral bioavailability . The control of gastro-intestinal transit could be the focus of the next decade and may result in new therapeutic possibilities with substantial benefits for patients. Cefpodoxime proxetil is a third generation cephalosporin prodrug which is administered orally with only 50% absolute bioavailabili-ty . By formulating the drug as a sustained action dosage form, especially as a floating dosage form, its bioavailability may be improved. Because of the low bioavailabili-ty of cefpodoxime proxetil due to intestinal lumen hydrolysis may be to some extent prevented. Moreover, the absorption of the cefpodoxime proxetil in the upper GIT is more [3, 4]. Floating drug delivery is able to prolong the gastric retention of microspheres, and thereby possibly improve oral bioavailabili-ty of cefpodoxime proxetil. Some studies have been contented to evaluate the suitability of various excipients to achieve floating dosage forms [5, 6]. Cefpodoxime proxetil was provided by Orchid Pharma and hydroxy propyl methyl cellulose (HPMC K 15M) from Coloron private Ltd, Asia and ethylcellulose (EC) by Signet Chemicals and ethyl cellulose purchased from Sd Fine Chemicals. Dichloromethane (DCM), ethanol and Tween 80 were purchased from Merck. Microspheres containing cefpodoxime proxetil as a core material were prepared by a non-aqueous solvent evaporation method. Drug and HPMC and EC were mixed in the mixture of dichloromethane and ethanol at a 1:1 ratio. The slurry was slowly introduced into 30 ml of liquid paraffin containing 0.01% Tween 80, while stirring at 1200 rpm using a mechanical stirrer equipped with three bladed propellers at room temperature. The solution was stirred for 2 h and the solvent evaporated completely, and filtered by using filter paper. The microspheres obtained were washed repeatedly with petroleum ether (40-60 °C) until free it was from oil. The collected microspheres were dried at room temperature and subsequently stored in desiccators . The microspheres (0.3 g).were spread over the surface of USP XXIV dissolution apparatus (Type II) filled with 900 ml of 0.1 N HCl containing 0.02% of Tween 80. The medium was agitated with a basket rotating at 100 rpm for 12 h. The floating and the settled portions of microspheres were recovered, separately. The microspheres were dried and weighed. Buoyancy percentage was calculated as the ratio of the mass of the microspheres that remained floating and the total mass of the microspheres . Figure 1. In vitro drug release profiles of cefpodoxime proxetil from FA1-FA6 formulations. The prepared microspheres with a size range of 75-600 μm were collected and weighed. The measured weight was divided by the total amount of all non-volatile components which were used for the preparation of the microspheres. In vitro drug release studies were carried out for all products by using USP type I (38) dissolution test apparatus. Pure drug (100 mg) was used for the dissolution studies and microspheres equivalent to 270 mg of the pure drug were used. Five ml aliquots were withdrawn at predetermined intervals and filtered. The required dilutions were made with 0.1 N HCl and the solutions were analyzed for the drug content by spectropho-tometer at 263 nm against suitable blank. Equal volume of the dissolution medium was replaced in the vessel after each withdrawal to maintain sink condition. Three trials were carried out for all formulations. From this, the percentage of drug release was calculated and plotted against function of time to study the pattern of drug release. Floating microspheres were prepared by non-aqueous solvent evaporation method with polymers such as HPMC and EC in various proportions. The microspheres were observed with ordinary microscope and were found to be irregularly spherical shaped and exhibited a range size from 75 to 600 μm. Microspheres size distribution was determined with the use of different grades of sieves. Each of the six formulation containing 270 mg of the drug with various ratios of polymer (EC/HPMC) from 1:1 to 1:6 was taken. No drug-polymer incompatibility was noted in their FT-IR spectra. The yield (%) for different formulations (FA1 to FA6) were determined. It was found that FA6 yielded 80.1%. In general, with formulation 1 (FA6), the yield was satisfactory (Table 1). The lowest yield was with FA1 (50.5%; Table 1). The encapsulation efficiency was determined using the non-aqueous solvent evaporation method. The entrapment efficiency was found to be 14.1% to 28.2% for formulation FA1 to FA6 . However, the entrapment efficiency was poor. It may be attributed to mixing technique used, physical compatibility with polymer used, and viscosity of media. Particle size may also play a part in the entrapment of drug. The buoyancy percentage for all batches was almost above 70%, which was studied for 12 h. The highest percentage was obtained with formulation FA6. Average buoyancy in percentage was found to be 70.1% to 88.2%. In general with increase in the amount of polymers, there was an increase in the buoyancy percentage. The increase in the buoyancy percentage may be attributed to air and gel forming polymer HPMC K4M which caused swelling because of increased amount of the polymers present. Microspheres were subjected to in vitro release using USP dissolution apparatus Type I in 900 ml of simulated gastric pH medium. With all of the formulations, there was initial intermittent burst release (Figure 1). But the release seems to be somewhat sustained with increase in the amount of polymer. The release rate was found to be decreased in accordance with the increase in ratio of polymer used (FA6; Figure 1). of microspheres after 12 h.
Floating microspheres of cefpodoxime proxetil were prepared using HPMC and EC, at the higher polymer to drug ratio improved the entrapment efficiency, percentage of yield as well as buoyancy percentage. In case of cefpodoxime proxetil floating microspheres, at the lower polymer to drug ratio there was a significant increase in drug release, seen at the 1:2 ratio. Formulation FA2 found to be the best formulation among the various polymer to drug ratios. Gangadharappa HV, Pramod Kumar TM, Shiva Kumar HG. Gastric floating drug delivery system: A review. Indian J Pharm Educ Res 2007; 41: 329-36. Dave BS, Amin AF, Patel MM. Gastroretensive drug delivery of ranitidine hydrochloride: Formulatin and in vitro evaluation. AAPS Pharm Sci Tech 2004; 5: Article 34. Kakumanu VK, Arora VK, Bansal AK. Investigation of factors responsible for low oral bioavailability of cefpodoxime proxetil. Int J Pharmaceutics 2006; 317: 155-60. Crauste-Manciet S, Brossard D, Decroix MO, Farinotti R, Chaumeil JC. Cefpodoxime-proxetil protection from intestinal lumen hydrolysis by oil-in-water submicron emulsions. Int J Pharmaceutics 1998; 165: 97-106. Merchant HA, Shoib HM, Tween T, Rabia I. Once daily tablet formulatin and in vitro release evaluation of cefpodoxime using HPMC: A technical note. AAPS Pharm Sci Tech 2006; 7: Article 78. Geogiannis VS, Rekkas DM, Dallas PP, Choulis NH. Floating and swelling characteristics of various exipients used in controlled release technololgy. Drug Dev Ind Pharm 1993; 19:1061-81. Kumar Srivastava A, Ridhurkar DN. Floating microspheres of cimetidine: Formulation charac-terization and in vitro evaluation. Acta Pharm 2005; 55: 277-85. Patel A, Ray S, Thakur RS. In vitro evaluation and optimization of controlled release floating drug delivery system of metformin hydrochloride. Daru 2006; 14: 57-64.